This cold water reservoir is a great place to enjoy flat water paddling with gorgeous scenery surrounding you in every direction. The Pikes Peak region isn’t known for its water sports, but those who love canoeing and sea kayaking can find a playground nearby. 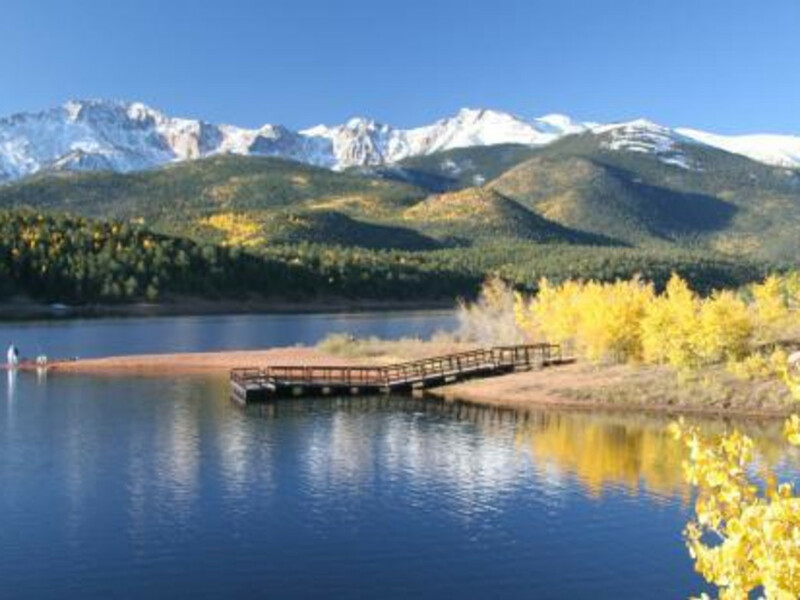 The North Slope Recreation Area is a vast stretch of land – 2,267 acres – on the flank of Pikes Peak. Each year, thousands of visitors view the North Slope from the windows of their cars as they drive to the summit of 14,115-foot Pikes Peak. Thousands more get out of their cars for hiking, fishing, boating, picnicking, and miles of mountain bike trails that connect to other trails on the mountain. The recreation area, opened in 1992 after years of deliberation about its use, holds three reservoirs that are part of the water supply of Colorado Springs and several surrounding communities. Crystal Creek Reservoir, North Catamount Reservoir and South Catamount Reservoir are open to boats propelled by oars, paddles or electric motors. Many come here to test their sea kayaking skills. The water here is generally calm but very cold because it is a basin for melting mountain snow. Elevations here range from 8,560 to 9,719 feet. Many fans of this area combine fishing and boating – using belly boats, canoes or other small boats to fish for rainbow, lake, cutthroat and brook trout. (All three reservoirs are stocked but locals know the biggest fish – sometimes upwards of 30-inch lake trout - are found at North Catamount where only artificial flies and lures are allowed). Gas motors aren’t allowed, so this is a pretty peaceful place to work your oars. This is flat-water boating with one of the best views in the region – the summit of Pikes Peak glows in the background. Crystal Creek Reservoir has 3.31 miles of shoreline; North Catamount has 6.58 miles, and South Catamount has 3.96 miles. From Colorado Springs, take U.S. Highway 24 west to the Pikes Peak Highway exit in Cascade and follow the signs to the Pikes Peak Highway entry gate. Entry fee is $4 per person (age 16 and older). If you decide to drive further up the highway, there is an additional fee. The area is closed from the third Sunday in October through May 1. There is a small gift shop that carries bait and snacks at Crystal Creek Reservoir. You’ll find the Crystal Creek Reservoir just off the highway near mile marker 6; North and South Catamount Reservoirs are a short distance off the highway near mile marker 7. The recreation area is managed by the City of Colorado Springs in cooperation with the Colorado Division of Wildlife and the U.S. Forest Service. Only non-gasoline-powered boating and belly boating are allowed, along with mountain biking, picnicking and hiking. Boats must be carried on car-top carriers or in the back of pickup trucks – trailers are prohibited from the highway. Boats must be carried from vehicles to the water entry points. Personal flotation devices are required.